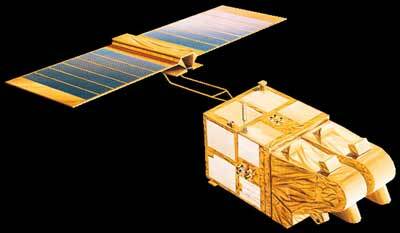 The satellites SPOT 1, 2 and 3 (Satellite Probatoire de l'Observation de la Terre) were the first generation of SPOT earth observation satellites operated by Spot Image. The first generation SPOT satellites were built on the SPOT Mk.1 bus with a lifetime of three years. The SPOT satellites were identical, with each carrying two identical HRV (High Resolution Visible) imaging instruments that were able to operate in two modes, either simultaneously or individually. The two spectral modes are panchromatic and multispectral. The panchromatic band had a resolution of 10 meters, and the three multispectral bands (G,R,NIR) have resolutions of 20 meters. SPOT 3 carried also the POAM-II (Polar Ozone and Aerosol Measurement) instrument to measure the vertical distribution of atmospheric ozone, water vapor, nitrogen dioxide, aerosol extinction, and temperature, which was provided by the US Naval Research Laboratory (NRL). SPOT 1 was launched with the last Ariane-1 rocket on 22 February 1986. At the end of operations in 2003, the orbit was lowered to gradually lose altitude until reentry. SPOT 2 followed on 22 January 1990, on an Ariane-40 H10 rocket. It operated until July 2009. Its orbit was lowered to ensure reentry within 25 years. SPOT 3 was orbited on 26 September 1993 also on an Ariane-40 H10 rocket. It ended operations in November 1996 due to problems with its stabilization system.